Yesterday, I found out that I had tody off...so immediately Del said, "you want to go play golf?!" I agreed. 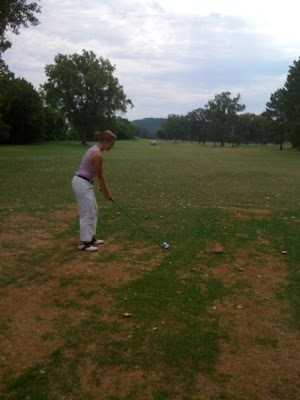 So, this morning we got up early, went to breakfast at Satellite Cafe, and then hit the course. Right away, I could tell that I had chosen the wrong thing to wear. I was SWEATING profusely. So, I made a deal with Del. 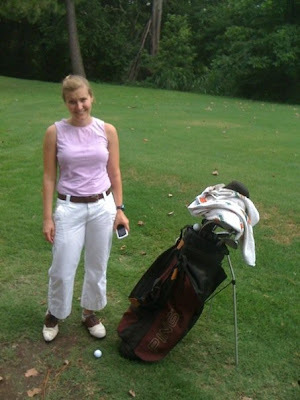 We would play 9 holes, go home, do yard work, (I might go shopping and buy a pair of shorts), and then come back in the evening and play some more. When we got to this hole, I thought, either I have stepped onto a cotton plantation, or it's going to be really difficult trying to find my ball in this mess. oh look, there it is...right next to more cotton. I'll let you know how our evening round of golf goes.